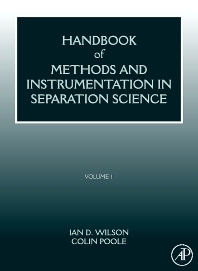 Handbook of Methods and Instrumentation in Separation Science, Volume 1 provides concise overviews and summaries of the main methods used for separation. It is based on the Encyclopedia of Separation Science. The handbook focuses on the principles of methods and instrumentation. It provides general concepts concerning the subject matter; it does not present specific procedures. This volume discusses the separation processes including affinity methods, analytical ultracentrifugation, centrifugation, chromatography, and use of decanter centrifuge and dye. Each methodology is defined and compared with other separation processes. It also provides specific techniques, principles, and theories concerning each process. Furthermore, the handbook presents the applications, benefits, and validation of the processes described in this book. This handbook is an excellent reference for biomedical researchers, environmental and production chemists, flavor and fragrance technologists, food and beverage technologists, academic and industrial librarians, and nuclear researchers. Students and novices will also find this handbook useful for practice and learning.